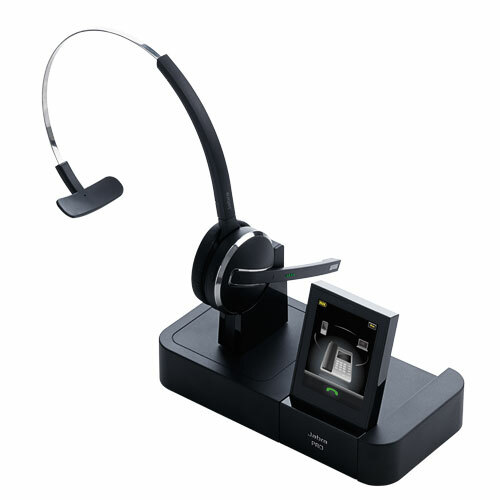 Specifically designed for executives, managers and other professionals the Jabra Pro 9470 (w/ KB PLUS PACK) headset allows you to switch between your computer, landline phone and cell phone, with an amazing 490-foot wireless range letting you talk all around your office! The Jabra 9470 redefines the groundbreaking technology of the Jabra GN9350e wireless microphone by extending the previous 350 foot range to 490 feet, introducing higher-quality wideband rich sound quality (a must for CEOs and salespeople), incorporating Bluetooth connectivity, doubling the noise cancellation of its predecessor (via a dual microphone element system Jabra refers to as "Noise Blackout”) and adding a gorgeous 2.4 inch color touch sensitive VGA screen to simplify setup and operation. If you're looking for an inexpensive speech recognition microphone, the Jabra 9470 isn't it. However, if you are an executive, salesman or simply want to use one microphone for the best sound quality over your landline/VoIP, multipoint connectivity to your cell phone and 99% speech recognition accuracy, this is your microphone. I now use the Jabra Pro 9470 extensively because no other microphone is as versatile or easy to use when you need to switch between landline phone calls, cell phone calls, dictating e-mails and web support (not to mention the occasional Live Online Support). Although we have found a few microphones that can match the 9470's accuracy, no other wired or wireless microphone can match it's versatility and that is why the Jabra Pro 9470 has just become my combination speech recognition/landline telephone/cell phone microphone of choice. The amazingly versatile Jabra PRO 9470 multiuse headset allows you to selectively switch between speech recognition, landline, VoIP, and cell phone by combining both DECT 6 and Bluetooth technology. It features crystal-clear sound and a whopping 490-foot wireless range letting you talk all around your office. A stylish touch-screen base unites the three devices – desk, cell, and speech recognition. The base connects to your headset via DECT™ 6.0 – a technology characterized by its reliable, long-range capabilities. Equipped with a SmartSetup wizard, the touch screen helps you connect your phones and select preferences to get started. Once you’re up and running, the screen’s colorful icons and intuitive menu make call handling a breeze. The Jabra PRO 9470 features several advanced sound technologies that deliver unrivalled call clarity and safety. A dual microphone Noise Blackout™ system with advanced Digital Signal Processing practically eliminates most background noise, so your voice can always be heard clearly. Wideband quality ensures that the sound you hear is crystal clear, while SafeTone technology protects your hearing. 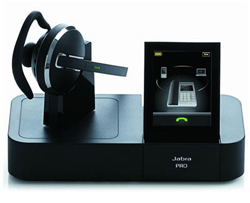 The Jabra PRO 9470 also supports narrowband to match phone systems. Bandwidth (narrowband or wideband) can be selected per phone. Unbeatable sound — a dual microphone Noise Blackout™ system with advanced Digital Signal Processing practically eliminates all background noise while wideband audio delivers crystal-clear sound. 3-in-1 wearing styles — let you swap easily between wearing styles and attach the headset to whichever ear you prefer. The Jabra PRO 9470 comes with headband, earhook, and neckband wearing styles. Up to 10 hours talk time — in narrowband sound mode and up to 8 hours of talk time in wideband sound mode will take you through your whole day without interruption! Both wideband and narrowband work well and NaturallySpeaking but if you're not using your system for a VoIP phone, we recommend narrowband which still sounds great on a landline but gives you an additional 2 hours of talk time. Voice recording — from your desk phone lets you save your conversations on a PC. (PC recording application required). Note that professional versions of NaturallySpeaking already include a PC recording application. Kensington Lock — protects touch screen base from theft.